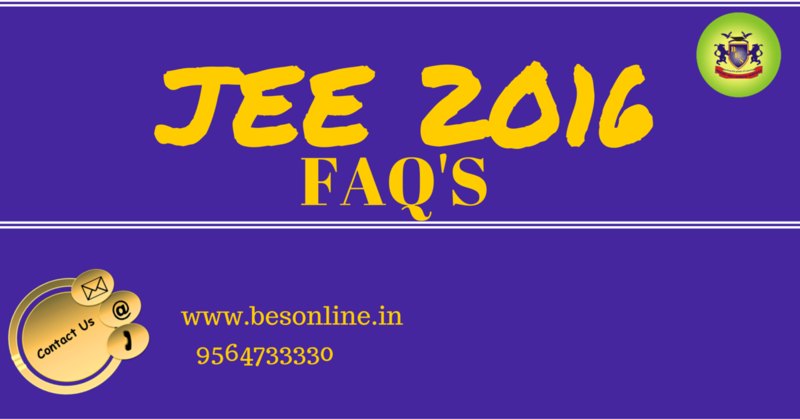 1.Who is eligible for JEE – Main? General Category- Candidates whose birthday falls after 01 Oct 1991. SC/ST/PwD- Candidates whose birthday falls after 01 Oct 1986. Candidates who have passed their class 12th exam or who are appearing for it in 2016. 2.How many times a candidate is allowed to attempt JEE Main? A candidate may appear to a limit of three times. 3.Can a candidate change the preference for the mode of examination? A candidate can only change the made of examination from offline (Pen and Paper Based) to online (Computer Based) examination. 4.What happens if a candidate does not book his/her slot for the online examination after paying the fees? The candidate will be randomly allotted a slot with the date and time which will be mentioned on the admit card. The same can be downloaded from the website. 5. What are the dates for Computer Based examination? 6. When will be result of JEE-Main 2016 be declared? 7. Can a candidate get some practice test? The mock test is available on the website and can be downloaded for practice purpose. For any other assistance on filling the application form of JEE Main and other educational queries related to the same, the students can connect with us at 9564733330 for a free counselling session!